The term “commercial fencing” in Northern Virginia covers a wide spectrum of fence materials, functions, architectural styles, security grades, and installation requirements. 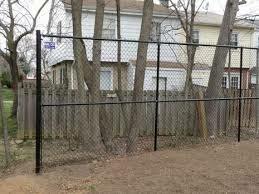 The fence experts at Hal Co Fence have experience with most all commercial fencing applications. Northern Virginia business owners have partnered with us for almost 40 years for quality design, installation, and maintenance of their commercial fencing. As a family owned and operated business, we understand your business needs for affordable, secure commercial fencing for Northern Virginia property and vital company assets. Working together, we develop a scope of work based on your specifications that meets all local building and zoning regulations. From conception to passing final inspection, Hal Co is your go-to commercial fencing company in Northern Virginia. When building your comprehensive business security management plan, commercial fencing in Northern Virginia is a primary investment in the unfailing operation of your company facilities as well as the safety and health of employees and guests – and that’s all good for your bottom line. For almost 40 years we have worked with all types of commercial fencing, and look forward to working with you on yours. Contact us today to get started on protecting your vital privacy and valuable business assets with quality commercial fencing in Northern Virginia. Let Hal Co Fence exceed your expectations. 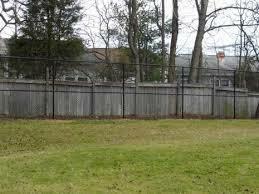 When you need commercial fencing in Northern Virginia, contact the proven professionals at Hal Co Fence & Deck. Chain link fence in Northern Virginia remains the most popular type of fencing chosen for a variety of applications and settings by homeowners and businesses alike. Inexpensive, practical, and nearly indestructible, a traditional chain link fence in Northern Virginia enhances your property’s security and privacy. With lifespans averaging 30 years, this is one investment in protecting your home, family and assets that yields solid returns every day. 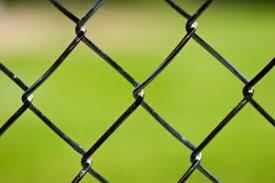 Chain link fences in Northern Virginia are available in a variety of colors, sizes, lengths and wire gauges, or measured thickness. The lower the gauge, the stronger the material, the higher the cost. And chain link fence is relatively simple to install, affording remarkable flexibility in the placement of accessories and features such as gates, openings, and additional enhancements depending on the level of security and privacy your property requires. A chain link fence in Northern Virginia, with it’s classic, transparent open diamond weave, can secure your property boundary or cordon off an area where pets and children can play safely, equipment can be secured, or to prevent accidents around the family pool or in your workplace. Businesses often use chain link fencing indoors as a means to partition valuable real estate space for special use or highly secured areas. For additional privacy consider adding slats to your chain link mesh without requiring additional maintenance. Privacy slats, inserts, wind screens, and chain link fence webbing have all appeared with recent advances in technology. These custom options add color, texture, privacy, and style to the otherwise blank face of the chained link fence. With lumber prices rising and many seeking low-cost fencing options, today’s vinyl coated chain link fence is a smart option. Your chain link fence in Northern Virginia to can be coordinated with your home or business exterior for a stylish, almost invisible barrier for any fencing project, and give you peace of mind for decades to come. 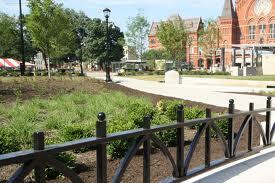 Commercial fencing for Arlington, VA businesses is often considered a critical necessity. For those business owners that need to add or service commercial fencing in Arlington, VA, the commercial fencing experts at Hal Co have the experience, talent and capability you need. Our seasoned commercial fencing team provides design support for owners, architects, developers and general contractors. From conceptual estimates and specifications in the preliminary stages of a project, through to project completion and continuing on to periodic maintenance, Hal Co is committed to your commercial fencing needs. Arlington, VA businesses can trust Hal Co’s 27 years of fencing experience to bring you a highly-trained team of commercial fencing professionals to deliver commercial fencing in Arlington, VA on time and within contracted budgets. Hal Co commercial fencing in Arlington, VA comes complete with our customer satisfaction guarantee. 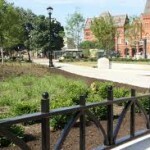 We also serve the residential fencing market, and are in a position to offer you a unique mix of materials to consider for your unique commercial fencing needs, including Cedar and exotic wood species, PVC Vinyl, Aluminum, and a variety of decorative and ornamental fencing for whatever your next commercial fencing project demands. Your business can depend on the professionals at Hal CO to deliver value when they design, install and service your commercial fencing in Arlington, VA. Call Hal Co today to get started right away. 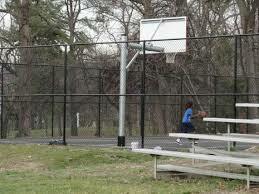 There was a time when commercial fencing in Fairfax, VA meant chain link or wrought iron. Now there is an amazing array of commercial fencing materials on the market for practically any commercial design or application. Whether you need commercial fencing wired in as part of your integrated security system or a multi-site commercial fencing maintenance contract, a full-service commercial fencing company in Fairfax will work with you to assess your needs and investigate what options are most-cost effective for your situation. With over 27 years of commercial fencing experience you can count on HAL CO to deliver dependable manpower with the talent and drive to finish your project on time and within budget. Best of all, all Hal Co projects come with our customer satisfaction guarantee. 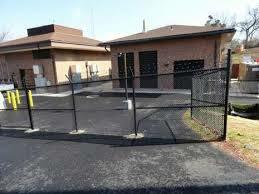 There are several sturdy materials commonly used in commercial fencing to provide varying degrees of security. 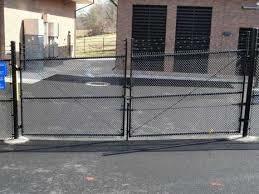 Chain link is the standard for manufacturing and government security fence installation. These products are made following strict ASTM or federal specifications. 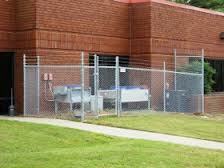 K-Rated High Security Fences provide maximum security perimeter protection. Look for galvanized, anodized, non-ferrous metallic and powder coated products to meet your particular commercial fence requirements. 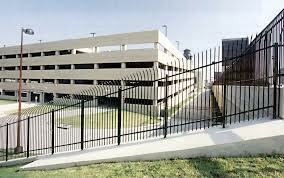 Other high-security commercial fencing alternatives include un-climable chain link fence (smallest is 3/8” mesh), ornamental iron fence, vinyl coated chain link fence and perimeter security solutions. 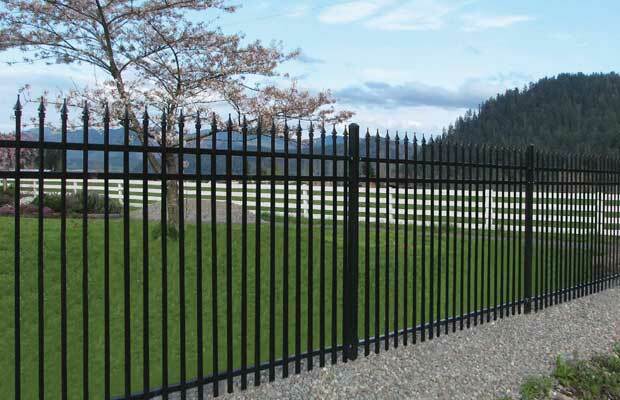 Aluminum offers a less expensive option to steel ornamental fencing with the same polished, embellished style. 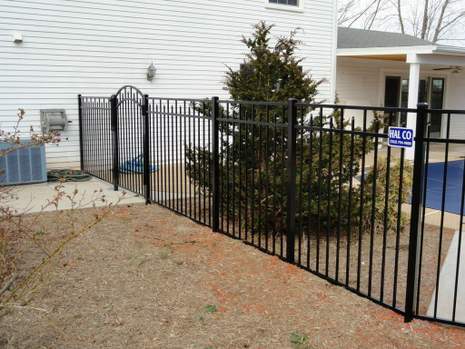 Warranties and powder coated finishes allow the same maintenance-free ease, while aluminum fencing offers a distinctly lower-cost advantage. Steel ornamental commercial fencing coated with an electro-statically applied powder coating creates a durable, strong finish that outperforms its painted counterparts. 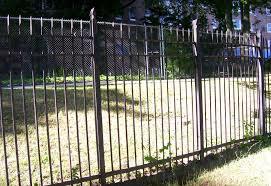 The classic wrought iron fence by a new name is still the strongest perimeter security known to commercial fencing. 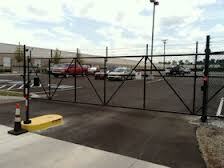 Every security situation is different, and so is every commercial security fence. Once you explore the variety of commercial fencing in Fairfax, VA, you will be prepared to make the most well-informed decisions to protect your most important company assets – your people and your property.